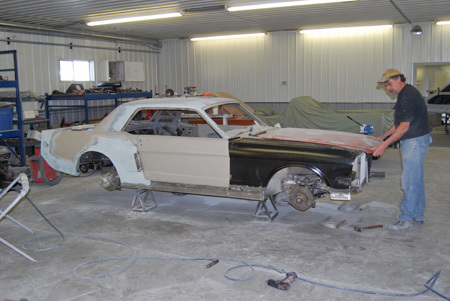 The bodywork involved in our Resto-Mod restorations includes hammer and dolly use, dent and ding repairs with plastic and fiberglass fillers, some body panel alignments and fitting and the application of prime coats. Keep in mind that our approach to all these topics is from the do-it-yourselfer's point of view, rather than that of the classic car coachbuilder. Jeff Noll and Jim Mokwa built beautiful, trophy-winning-quality Resto-Mods. Jeff's car was recently invited to be exhibited at the Milwaukee Auto Show-an honor extended to very few Resto-Mods. But these cars aren't going to the Pebble Beach Concours d' Elegance to be judged. An auto body dolly is a heavy piece of rounded, wedge-shaped metal used in conjunction with a body hammer or slapping spoon to smooth out dents, bumps or other imperfections in automotive grade sheet metal. Like a blacksmith's anvil, the auto body dolly is used as a smooth surface against which a car's sheet metal is pounded to take out surface imperfections. You hold the dolly against the back of the metal while you're hammering on the other side of it. The hammer can be used to either strike directly on the spot that the dolly is held under or to strike off to one side of that spot, depending on how you want to shape the metal between the two tools. While you might think the hammer does the smoothening, but it is actually the rebound action of the dolly, after you strike on it with the hammer, that does most of the metal smoothening work. These two tools play into a Resto-Mod restoration in different ways. The hammer and dolly can smooth out a previously damaged door skin like the one that Jeff Noll found on the driver's side of his car. You'll remember that Jeff pulled the door skin back into its shape with the spot-weld puller tool he borrowed from Bruce Young. Jeff then wanted to make the Camaro's door look as smooth as new. From his friend, he learned it was bad practice to use a thick coat of filler to recreate the correct fender shape, since a thick coat of filler can crack. A better option is to hammer and dolly the fender until it is brought back quite close to the original shape and then use just a thin "skim" coat of filler to finish the repair. Leo Coonan used wrenches, jacks, pry bars, his hammer and dolly, various other tools and some old-fashioned elbow grease and grunt work to get the body panels on Jim Mokwa's 1969 GTO ragtop into perfect alignment. A hammer and dolly can also be used to achieve proper alignment of the sheet metal parts. Jim Mokwa told us that getting correct panel fits prior to painting was the most important part of the bodywork done on his GTO. If you try to bend or fit a panel after paint is applied, you will damage the paintwork. 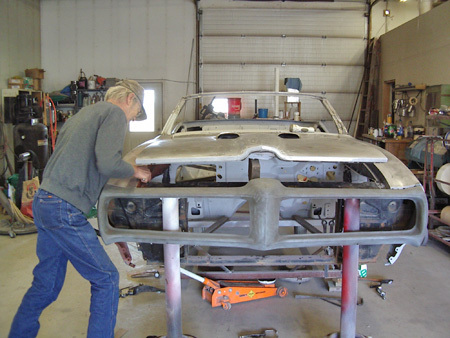 Jim and his body shop man, Leo, completely assembled the body of the GTO on the frame before attempting to use primer. This allowed them to check door alignment, etc. Only after they were totally satisfied with the panel fits, did they again disassemble the car and remove the body from the frame for painting. The force and accuracy of the body man's hammer blows is important. You should start by using the flat side of the hammer head on flat and convex metal surfaces; then use the curved face side on concave surfaces. Do not try to fix a curved surface with a flat dolly, since this technique will never work. When you want to use the "hammer-on-dolly" method, bring the hammer down directly on the spot behind which you are holding the dolly. By using a part of the dolly that closely matches a panel's original shape, you will push the panel back into that shape. When you bring the hammer down with a proper light to medium blow, it will make the dolly rebound and push the metal higher from underneath. The metal area immediately below the hammer strike will rise up. When you use what is called a "hammer-off-dolly technique,' the dolly is placed to the side of the spot where the hammer hits. This will push the metal under the location of hammerhead contact down, while the metal off to the side, above the dolly, will be pushed up. By using light blows and moving the positions of the two tools, you'll be able to "work" high and low spots out of the body panel. Only after this man is finished making adjustments to the hood on this early Mustang will it proceed to the body shop and paint booth at Muscle Up Hot Rod & Performance in Janesville, Wis.
Dent repair involves reworking the damaged area until the correct contour of the metal has been generally restored, then applying very light coats of plastic body filler to smooth out the low spots. If you have room to get a dolly behind a dent, you can restore the basic shape by using a hammer and dolly. Or, if you need to spread out the down-force for a big dent, you can substuture a "slapping spoon" for the hammer. The spoon is simply a kind of flat hammer. If you can't get your body tools behind the dent, you can use a puller such as Jeff used to fix his door. Or another possibility for small, soft dents on a panel without any creases is to use a suction cup tool that seals to the door and has a pull handle. After you have reworked the dent (or other irregularities) using one of hammer-and-dolly techniques, the next step in the repair process is to apply your body filler to bring any low spots up to the level of the surrounding metal. When done properly like this Muscle Up Hot Rod & Performance Shop Mustang restoration, there is nothing wrong with using modern, high-quality plastic body filler to repair any body damage on your Resto-Mod project car. 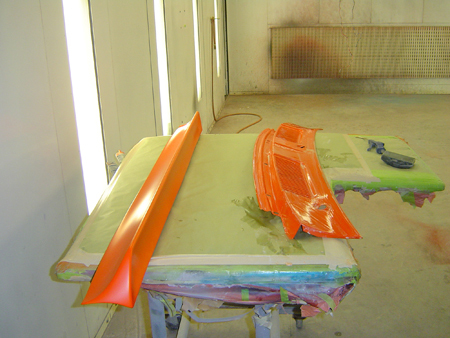 Acrylic enamel is easiest to use on a car that's being completely refinished, such as both Jeff's Camaro and Jim's GTO. With this type of paint you can cover with three coats or less. There's an advantage in that acrylic enamel does not have to be rubbed out or buffed out later. However, it has to be sprayed in an absolutely clean environment, since dust flaws cannot be color sanded out. Also, if you plan to topcoat your paint with, say, lacquer graphics, you will need to first apply a sealer so that the acrylic enamel will accept the lacquer on top of it. An acrylic lacquer is a good paint choice for a hobbyist painter, since it requires no hardener. It is easy to mix and to spray at low pressure and it dries fast. Acrylic lacquer can also be color sanded and is easy to touch up. Lacquer solvents throw off high VOCs, so the use of lacquers is being controlled and down-draft paint booths with special filters and air-purification equipment may be required to spray lacquer in many locations, if it is permitted at all. The 2011 Hot Rod & Restoration Show showcased two cars with stunning urethane enamel "hot rod" paint jobs. The first was displayed at the House of Kolor (www.houseofkolor.com) stand; the other was a race car that Sherwin-Williams Automotive (www.sherwin-automotive.com) had supplied paint for. Urethane enamel is made by mixing pigment with a polyurethane (plastic) binder. The shiny urethanes dominate the automtive aftermarket today. All urethanes have some degree of glossiness, because they reflect light. However, semi-gloss versions have been developed and are used on many Resto-Mods. Urethane was introduced in the mid-1960s muscle car era, which makes it a good choice for Resto-Mods. It evolved out of new plastics technologies invented back then and proved to have better durability than conventional enamels. Ultravoiolet rays have little affect on urethane enamels and it is widely liked by car painters for its shiny, glass-like appearance and extreme durability. The downside of using urethane enamel is that it is highly toxic in its uncured state, This is why product sheets and even can labels specifically recommend use of a full face supplied-air respirator and spraying in a well-ventilated area away from all sources of heat and flame. Also recommended are full personal protection gear including gloves and a complete "spaceman" suit. As you can see, the 1955 system of refinishing your car with a bucket of paint and some newspaper spread on the floor is out the window. In fact, even after you purchase primer, paint and clear you'll have to buy a number of other "paint system" products if you want a shiny finish that won't fade, crack or peel. The extras may include a flex and a fish-eye eliminator for silicone residues. Remember that we recommended putting as much thought as you possibly can into painting your Resto-Mod. An important step in the process is color selection. Since your goal is to make this car look the very best you can make it look, we recommend picking a color that stands out in a crowded hall full of outstanding cars. If blue is the "in" color this year, pick another hue. You want your car to leap out—not blend in. The companies we've given you Website information for seem to have colors your local auto supply store counterman never heard of and that's the way to go. Contact them and ask to see samples. Jeff Noll used a Dupont basecoat clearcoat paint. It was not really a system, but included the typical products used by a typical body shop. In other words, readily available materials that were not as costly as some of the more exotic brands. The sealer he used was available in four shades, No. 1 being lightest and No. 4 being darkest. The standard Hugger Orange color called for a No. 2 or 3 shade sealer, but the paint shop only had No. 1 or 4 available, so Jeff used No. 1 White. This turned out to be a great choice, because it really makes the Hugger Orange paint "pop" much more than a darker sealer would have. Since any surface you're planning to put paint on has to be free of dirt as well as chemicals. After washing the car top to bottom, wipe down any bare metal surfaces with wax and grease remover. Have two clean flannel cloths handy, one with the cleaner on it and the other to dry with. Pick up a package of tack cloths or micro-fiber cloths to pick up lint, microscopic dirt and contaminants. The glory days of 1955 and spraying auto paint outdoors are gone. To do things right, you need a paint booth (or access to one). For a single car, you can possibly make a temporary booth by building a "shower curtain" around the car with sheet plastic. Add a fan to vent off the fumes. Wet down the floor to reduce any dust you could kick up on the car. But, using a booth is a far better option. Jeff Noll's Camaro was painted at Jamies Customs, in Big Bend, Wisconsin. Their big downdraft paint booth kept dust to a minimum. Jeff Noll had his car painted at his brother-in-law's custom bike shop, Jamies Customs, in Big Bend, Wisconsin. They had a downdraft paint booth that helped keep dust to a minimum. A typical two-stage vertical air compressor was in service there and HVLP spray guns were used to apply the paint. 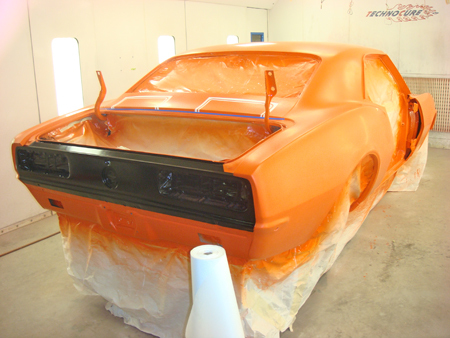 To prep his Camaro, Jeff used two coats of Dupont 1120S Primer Filler costing over $100 a gallon on all surfaces and dry block sanded between each coat and prior to final paint with 120-grit 3M paper. He installed joint sealer at all weld joints, like where the rear quarters meet the rockers inside the door jambs, along both sides of the rear panel above the trunk where it meets the bottom of the window and along the entire tail panel where it meets the quarter panels. Jeff then taped off the car for paint using high-quality automotive masking tape to cover areas he didn't want paint to get on. Since the wheels and tires were mounted, he covered them carefully. Eastwood makes products specifically designed to keep paint off such parts. For large areas, use masking paper—not newspaper, which is more porous and may let some paint sneak through. Jeff washed entire car with water and wiped it down several times with thinner. He then applied two lighter coats of DuPont's No. 1 White sealer. Small panels like the cowl and spoiler were painted separately. They were supported on a benchtop covered with masking paper taped over it. Jeff Noll had painted one vehicle, prior to the Camaro. He and his father sprayed a '70 Chevy pickup when Jeff was in high school. It was a typical D-I-Y project and they wound up with lots of dust in the paint. The Camaro was the first time he approached painting a vehicle in terms of doing a decent job the correct way. He got lots of guidance from Bruce Young and in the end had Bruce Young, Jr. do the actual painting. Jeff did not spray the sealer, paint or clear coat. 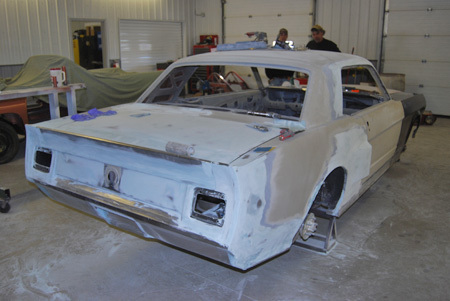 As previously covered, he did do the body work, priming and all the sanding up to prepping the car for final paint. This saved him a lot of shop time and money. Time is money. To save himself some hard-earned dollars, Jeff did most of the masking and taping himself, before Bruce Young, Jr. squirted paint. Jeff did most of the taping and masking with paper. He also laid out all of the body stripes. Bruce Young Jr. painted the panels that Jeff had taped off or otherwise readied for paint. Then, he let professionals spray the paint so he didn't wind up with runs. Jeff also did all of the color sanding between coats of paint, but he let Bruce buff out the final so that Jeff didn't burn through paint in spots. If you're also novice, but want to apply the paint yourself, the product and equipment you use is not going to ensure a good paint job. Only repeated practice sessions will do that. You'll learn that you have to mix the paint products according to instructions on the cans. You should test different fan patterns to see which combinations work best for you or on the part you're painting. The high-tech equipment available today is of pretty much even quality. Whether you buy an Eastwood gun or one from DeVilbiss, Binks or Sharpe, you'll need to get familiar with using it to spray different materials. Most guns have two adjustments, one for fan pattern and the other to control the amount of paint. Spray test panels before testing your newly-developing skills on an actual car. Hold a gun about eight to 10 inches from the surface you're painting and perpendicular to it. Spray using a straight-line movement that creates a band of color an inch or two wide. If the band looks heavy on each end and light in the middle, lower the pressure setting. Clogs will create a wedge shape. A pattern that looks wide at the upper or lower edge means your spray tip is dirty. Move up and down the side of the car, holding the gun in place and spraying paint at a right angle to the car. Move your body—not your wrist or arm. Each band of paint spayed on the car should go over about half of the one sprayed just before it. If you spray one spot too long or spray too much paint on a spot, you'll get a run. Since solvents control drying time, it is important not to rush. Wait until a surface is fully dry before spraying another coat. Painting over a layer that hasn't flash dried will trap the solvents and cause solvent popping later. Paint product labels list flash times, which may be longer for each subsequent coat. Using a clear coat cuts down the amount of solids needed to paint a car. Clear coats also smooth out edges. Clear is applied like other paint. You must wait for the previous coat to flash over before putting the clearcoat on. 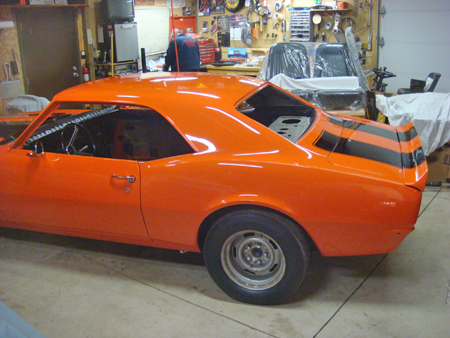 The Camaro's rear end was masked off so that the rear panel could be painted black. Note how the black is carried over the rear lip of the truck. 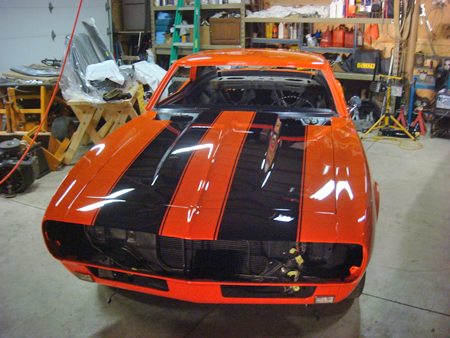 The process of painting Jeff's Camaro was affected by the way he applied racing stripes on the car. 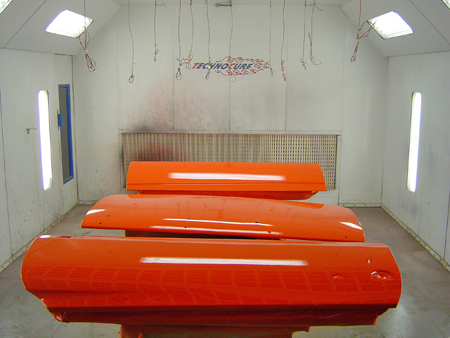 Bruce Young, Jr., first painted the car with Dupont base coat Hugger Orange, putting on three or four light coats to get good coverage. He then added three medium coats of Dupont clear. Since Hugger Orange is not a metalluic color, it was possible (and best) to paint the hood, doors, trunk lid, cowl and upper/lower front valences separately. 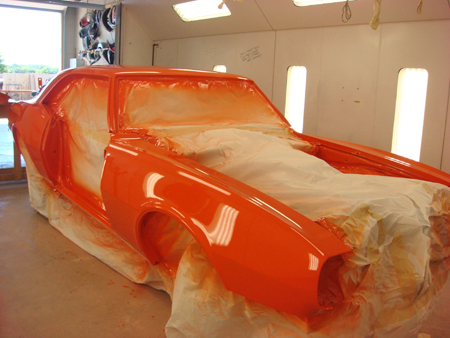 After the paint cured for about a week, Jeff carefully color sanded (wet sanded) the entire body of the car. Twin black racing stripes also set off the orange paint on the car's hood. The center of the hood was left orange for a dramatic affect. Jeff re-installed the hood, cowl and trunk so he could properly tape-off the rally stripes. He used a kit from Classic Industries (www.classicindustries.com) to create the black rally stripes. Then, he once again removed the hood, cowl and trunk lid so the rally stripes could be painted. After the basecoat black rally stripes were painted, Jeff removed the tape and used an airbrush to touch up some of the bad corners where tape did not make a sharp line at the curve. He then clear coated the car with three more medium coats of Dupont clear to "bury" the rally stripes. After the clear cured for about a week, he color sanded the entire car again. Finally, he buffed the entire car out using a wool buffing pad. At the rear of the car the racing stripes were taped off on three panel: the one under the window, the trunk lid and the spoiler. Professionalism shows here. Color sanding a car with special sandpaper that can be moistened is a technique used to polish paint topcoats to a deep shine and gloss. Very fine 1000- to 1500-grit sandpaper is used with water to smooth out very minor flaws. Not every type of paint can be color sanded. Enamel will be damaged by even minute sanding scratches. With multi-stage lacquers, such as Wanda displayed at SEMA 2010, only the clear coat can be color sanded or polished. As opposed to color sanding, true polishing of paint is done with a rubbing compound that has a relatively coarse grit to it. After an application of compound to flatten orange peel or polish paint to a shine, the finish must be buffed out with a very fine grit material. Use a microfiber cloth for polishing. Reduce swirls by using a front-to-rear back and forth motion rather than circular movements. Wrapping a vehicle with 3M™ Scotchprint® Series 1080 Wrap Film is a new way of "coloring" a vehicle without spraying paint. The clean-air cops really like that last part. You have probably seen trucks or buses that were wrapped to put billboard graphics or logos on them for advertising or corporate recognition. Resto-Mod builders have also used these wrap films to completely refinish show cars in Matte Black and Military Green. Matte White and Matte Silver wrap films are also available. There are Black and Anthracite (gray) Carbon Fiber films, too. Plus four Series 600 textured films including Light and Dark Wood Grains and Black and Anthracite Carbon Fiber. Experts are predicting that future production cars may be wrapped, rather than painted, to eliminate spray painting. Currently, wrap films and textured films are being used mainly for customization. 3M Corporation (www.3M.com) hints that it can add an endless array of head-turning finishes, textures and colors to cars by using such films and the installs will be cheaper than an expensive paint job. It does require some training and a few very simple, but unique tools to properly wrap a car with a film. An adhesive is activated with a watery spray and the film is then stretched into shape, as the moisture is squeezed out and the excess film is carefully trimmed. And, in case you're wondering, films can be removed if the car owner does not like the way the vehicle is being transformed before his or her eyes.